Born in Russia, I currently live in France. I graduated from the Moscow College of Arts, and I use many different techniques in my work, like watercolor, oil painting, or lace drawing. 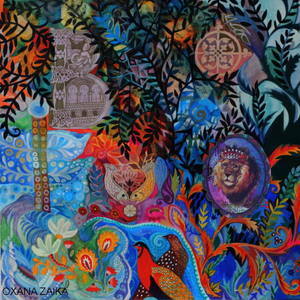 Bright colors, enchanting and various subjects (well, mostly animals... I'm a huge animal lover ! ), my work aims at evoking an optimistic and fantastic view of the world. Born in Russia, I currently live in France. I graduated from the Moscow College of Arts, and I use many different techniques in my work, like watercolor, oil painting, or lace drawing. Bright colors, enchanting and various subjects (well, mostly animals... I'm a huge animal lover ! ), my work aims at evoking an optimistic and fantastic view of the world. My works are currently exposed worldwide. Also, many of them are used as original designs for puzzles, stationnary objets, posters and cross-stich design. Though I never paint the same subject twice.